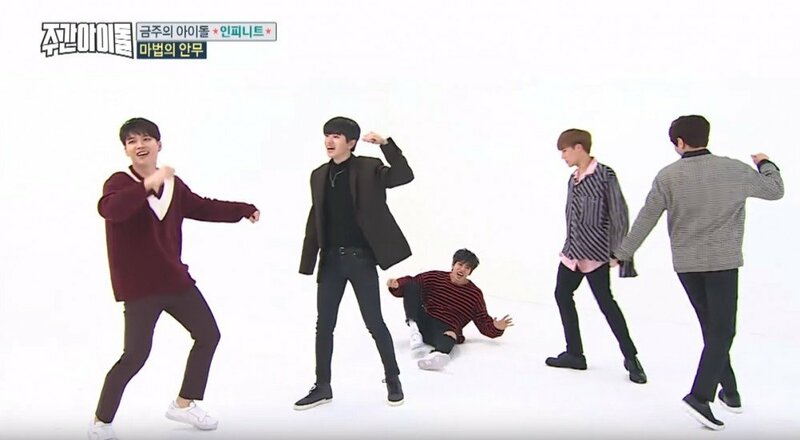 During the January 10 broadcast of MBC Every1's 'Weekly Idol', INFINITE participated in the magical choreography segment where they tried to match their�choreography to songs by other artists. The members switched things up dancing to Sunmi's "Gashina" using their own choreography from "The Chaser".� INFINITE froze as if enticed by the singer's voice, not knowing how to dance to the provocative track. Afterward, INFINITE's faces lit up with confidence as they heard Big Bang's "Bang Bang Bang�and began moving to the catchy beat performing the choreography from "Be Mine"; watching the official MV for guidance. Check out the hilarious footage above and below!